Michael "Knightmage" Wilson was born and raised in Cleveland, Ohio and now resides in Youngstown, Ohio. 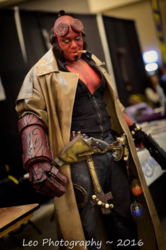 A current decorated 16 year veteran Deputy Sheriff for the Mahoning County Sheriff's Office in Ohio, Michael has been cosplaying since 2012 but the love for the comic and video game genre has been in his heart since he was little as it shows when he creates his costumes. Having many of his creations praised and displayed on numerous platforms in print and online, Michael has judged multiple cosplay contests as well as hosts cosplay panels at conventions showcasing the positive, inspiring and supportive side of cosplay. Having a love for acting and stunt work, Michael has worked on several Hollywood comic book movie productions including The Avengers, The Dark Knight Rises, Captain America 2: Winter Soldier and more. Michael was also an alternate for the 2006 reality show "Who Wants To Be A Superhero" hosted by Stan Lee. Michael has worked on and has been featured in several fan films and productions such as "Flash Fall" by Together Brother Productions and the YouTube series "MAN AT ARMS: Reforged - Predator Blades". Michael has also created various costumes for World Wrestling Entertainment superstars. Michael also is a spokes model for the independent comic companies "Shot In The Dark Comics" and "Transgenesis Comics", having his likeness used for upcoming comic book characters. Genuinely loving to entertain, make a positive impact and bring smiles, Michael most often uses his costuming by participating in many charitable events, benefits, parades, birthdays and hospital visits to children. This has led him to becoming a member of esteemed costuming groups such as "The League of Heroes, The Heroes Alliance-Ohio Branch, East Coast Avengers, Costumers with a Cause and Superheroes to Kids in Ohio and Heroic Inner Kids". Michael often works closely with local and national charity organizations as a sponsor, such as The Make-A- Wish Foundation, Capes 4 Heroes, Putting Downs First , Angels for Animals and many others. This has led Michael to making the "Knightmage: Cosplay Against/Awareness Campaign". Michael has received numerous awards for his charitable deeds including the "'Outstanding Service Award" from Credit Where Credit Is Due and most notably the "Presidential Volunteers Award" from President Barack Obama and the White House.